May 5776 bring you sweet adventures! L’shana tova/ Happy new year! Here’s our new Rosh Hashanah art. 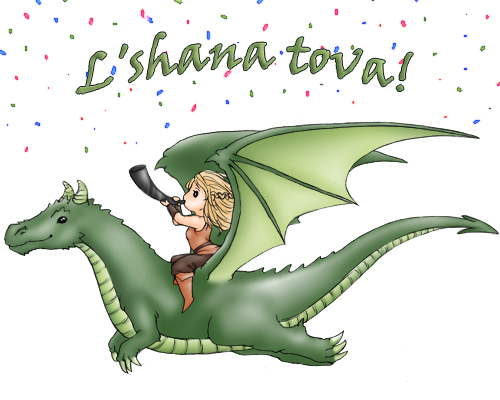 Jewish warrior woman Rivka and her beloved dragon (who is also Jewish) are ready to celebrate. If you want to read the story of how she had to rescue her dragon from a crooked innkeeper, it’s here. This entry was posted in Uncategorized and tagged 5776, ashkenazi, Dragon, dragons, fiction, happy new year, isaac, jew, jewish, judaism, l'shana tova, mangoverse, rivka, Rivka in Port Saltspray, rosh hashanah, shofar, tales from outer lands. Bookmark the permalink.